The words “tres leches” means three milks in Spanish. And true to its name, this cake is made with three milks. 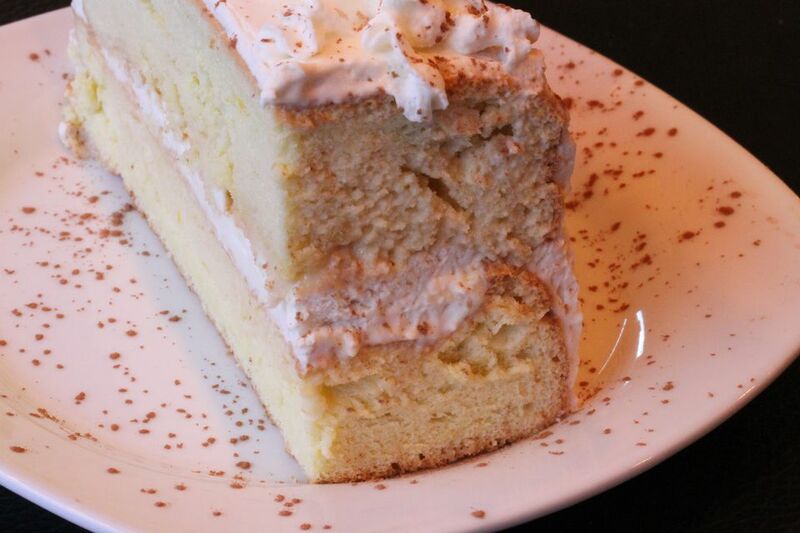 Tres leches cake is enormously popular and there are many variations throughout the Latino communities. Latin American food is very distinctive and varies a great deal in different countries and regions. Here is a version reminiscent of a coconut flavored tres leches cake from Puerto Rico. Because the cake is soaked in milk it must be refrigerated and it is extremely dense and moist. Lightly grease and flour a 9 x 13-inch pan. In a large mixing bowl, thoroughly mix together the dry ingredients — sugar, flour, baking powder, and salt. Add the softened butter and blend in with an electric mixer on low speed. The mixture should look crumbly at this stage. Add the milk and vanilla. Mix at low speed for about 30 seconds and then increase the speed to medium and beat for another 30 seconds. While you are mixing, be sure to scrape the bottom and sides of the mixing bowl to incorporate all the dry ingredients. Beat in the eggs, one at a time, about 30 seconds each time, on medium speed. Remember to scrape the sides of the mixing bowl as you go along. Pour the batter into the greased and floured pan. Tap the pan on the counter to release air bubbles and flatten and smooth out the batter. Bake the cake for 40 minutes. Note: This time is for a 9 x 13 cake pan. If you are using pans that are different in size, you will have to adjust the time. The cake is done when a toothpick inserted in the center comes out clean and it's golden brown around the edges and just beginning to pull away from the pan. Remove the cake from the oven and place it on a cooling rack. Allow it to cool in the pan for about 45 minutes. It must be completely cool before moving on to the next steps. Poke the top of the cake all over with a fork. You want hundreds of holes to soak up the milk. In a bowl, whisk together the evaporated milk, sweetened condensed milk, and coconut milk. Slowly pour the three-milk mixture evenly over the top of the cake. It should start soaking in right away. After you’ve poured all the milk, cover with plastic wrap and refrigerate for at least 2 hours – overnight is better. Place the ingredients in a mixing bowl. Using an electric mixer, beat on low until stiff peaks form. Increase to medium speed and beat until thick. Spread the whipped cream topping over the cake, sprinkle with toasted coconut flakes, and refrigerate until ready to serve.